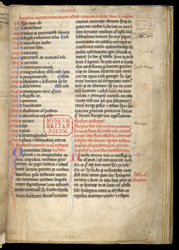 This Florilegium has a list a chapters and a prologue before the start of the main work. In the top right corner in purple ink is the ownership inscription of William Bedford (see also f. 1v), ending with the price 'xvi s viii d': 16 shillings 8 pence. In the top margin is the mark and signature of John Theyer (d. 1673), and in the right margin the name of his grandson, Charles.